You bought a new MEIZU phone and looking for easiest way to transfer data from old MEIZU phone to new MEIZU phone? You are out of town or in office and you want to transfer some data from your PC to your MEIZU phone or vice-versa but you don’t have data cable? It is best suited when you buy new MEIZU phone and move all/some data to new phone but you can use it on other occasions too. Even I used 3rd Party Apps like “Share it” until I learned about this feature in Flyme OS. 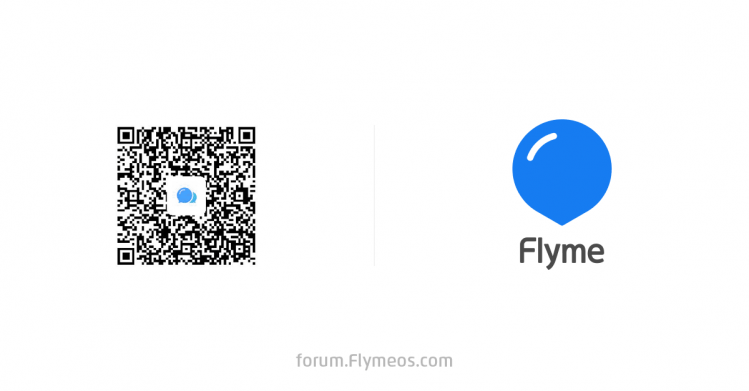 It was added later in Flyme 6 and now come pre-installed in all Flyme versions. Indeed, it is also pre-installed in Flyme 7 too. It is simplest method to transfer data to other MEIZU phone and it can transfer apps data & Settings configuration too. You can also use this app on other Non-MEIZU android devices too. One drawback is that it can’t transfer data from SD Card. I hope this will be added in future. Both MEIZU phones should be under same network. If you have Wi-Fi connection, connect both phones to same network. If you don’t have Wi-Fi, don’t worry. You can just turn on Wi-Fi hotspot on any of the phone (you don’t need to turn on data) and connect other phone to the same network. Both MEIZU phones should have same version of Migratool. But if both phones don’t have same version, it’s so easy to update the older version. You will be automatically prompted to update to newer version and you can update from there. It actually sends newer version apk to the older version apk phone to update it. Connect both MEIZU phones to same network and open Migratool in both phones. If only one phone has Migratool, you can tap on “Install Migratool on the other phone” and you can receive it on other phone through Bluetooth or scanning the QR code. And if you were living under the rock and don’t have Migratool on any phone, download it from here and please don’t uninstall it. Now you can see clearly in Migratool, there are 2 buttons– “Move from This Phone” & “Move to This Phone”. 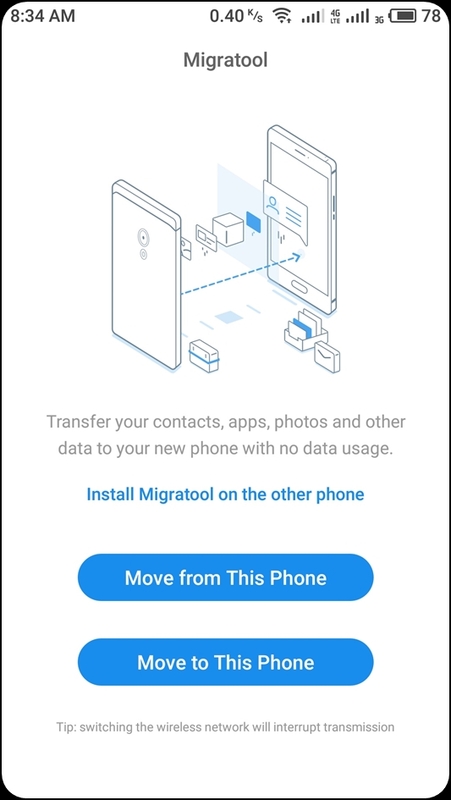 Tap on “Move from This Phone” in your old MEIZU phone or Sending phone and tap on “Move to This Phone” in your new MEIZU phone or Receiving phone. 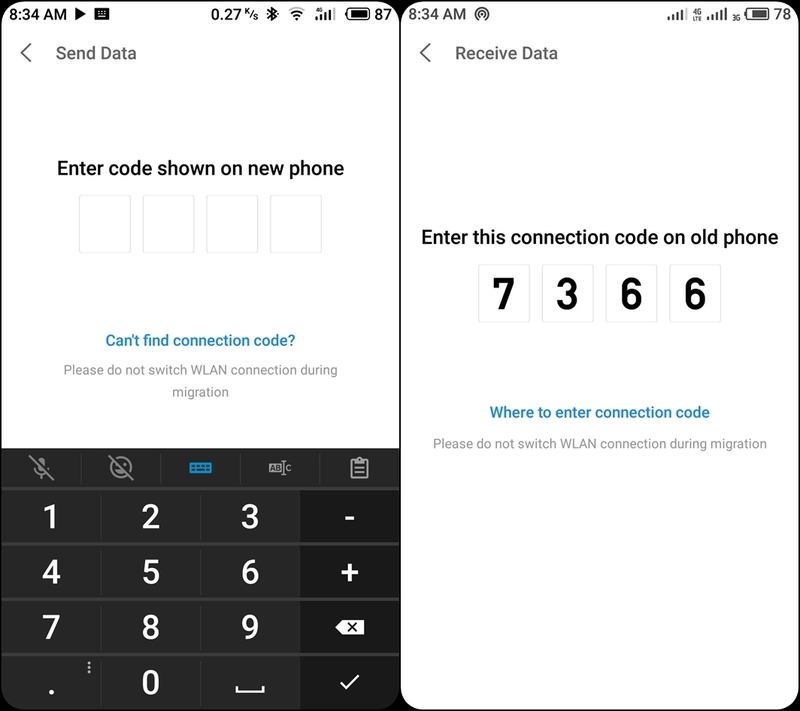 New MEIZU phone or Receiving phone will generate a 4-digit connection code. It will take few seconds. Enter this code in Old MEIZU phone or Sending phone. You will get “Please select data in old phone” screen on New phone or receiving phone and “Send Data” screen on Old phone or Sending phone. 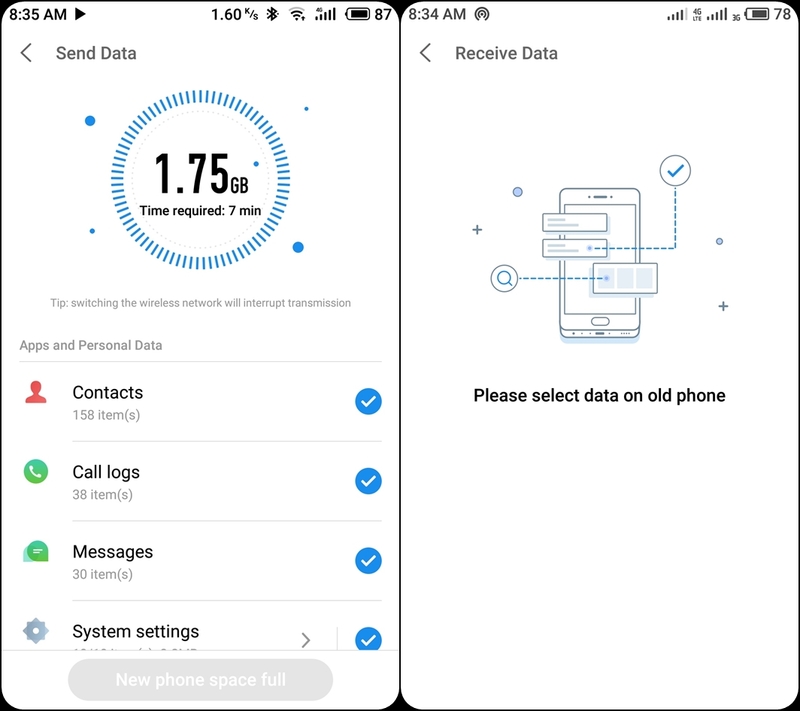 Select data in old phone or Sending phone which you want to transfer to new phone or receiving phone. You can select following data- Contacts, Call logs, Messages, System Settings, Apps, Music, Photos, Videos, Documents and Files. After selecting all data you want to transfer, tap on “Start to Send”. You will see data transfer progress in both phones. 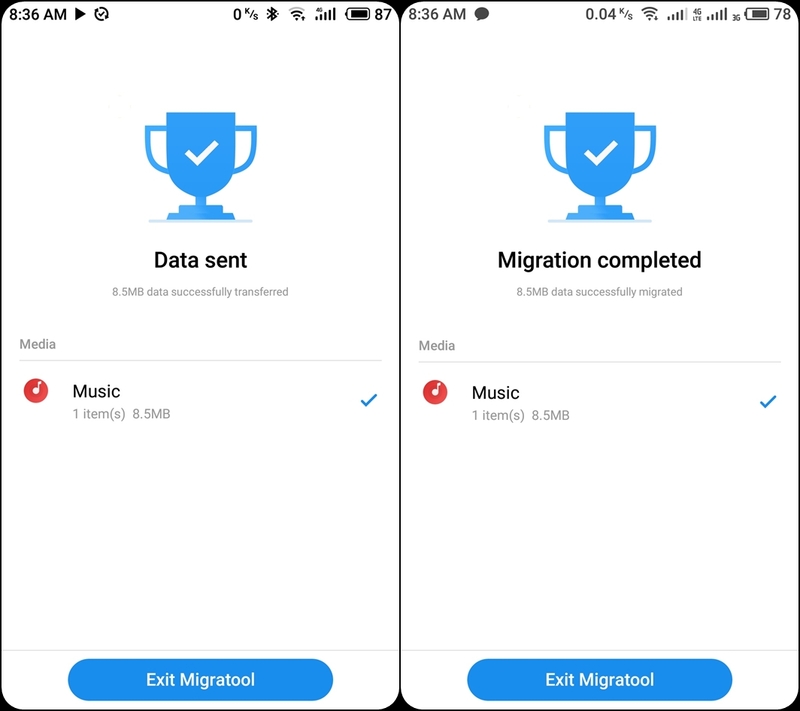 Once completed, you will see “Migration Complete” screen in New phone and “Data sent” screen in Old phone. Hurray, data is transferred successfully. Tap on“Exit Migration” on both phones to exit. 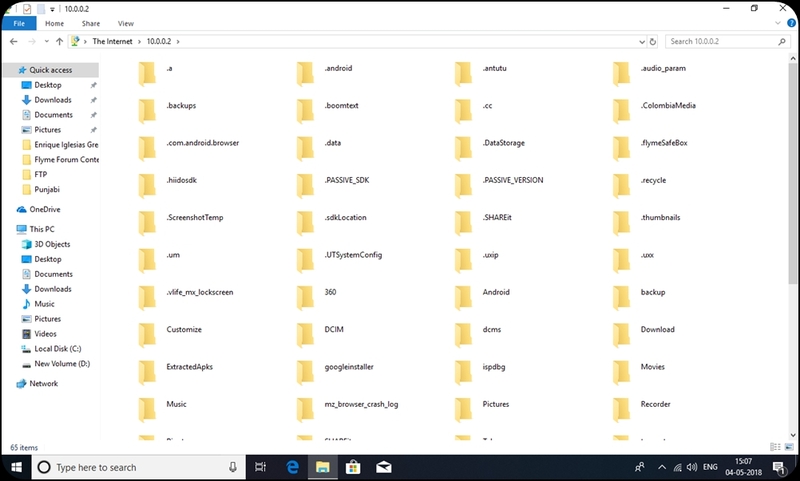 Note: - It will mirror the location of the files in old phone to new phone. For example, if you have music in “XYZ” folder in old phone, it will create same folder in new phone and transfer the file there. App interface is same in both phones when you open the app. This method is to prevent the hassle of using data cable to transfer data between Laptop/PC and your MEIZU phone. If you like to use data cable, you can still check this tutorial. It will help in some scenario where you are out of town and you forget to carry data cable. Here also, some people may prefer 3rd party apps like “Share it” but this method is way too simple. But this method too have same drawback – you can’t access SD Card. Use data cable if you want to transfer data to/from SD Card. Your laptop and MEIZU phone should be under same network. If you have Wi-Fi connection, connect both phones to same network. If you don’t have Wi-Fi, don’t worry. You can just turn on Wi-Fi hotspot in your phone (you don’t need to turn on data) and connect laptop/PC to the same network. 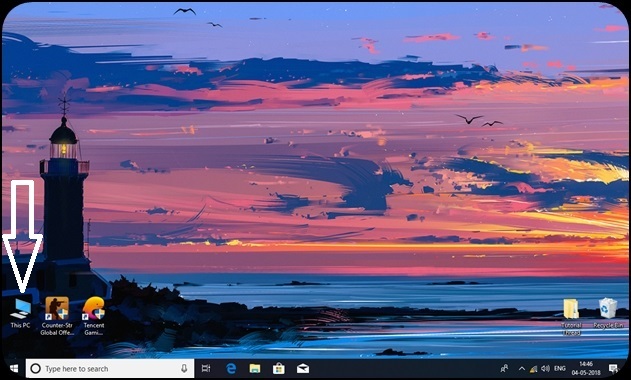 Note: - If your PC don’t have Wi-Fi adaptor but LAN connection (RJ45 port), you need to create Hotspot network on your PC then you need to connect your phone to same network. Connect your phone and laptop/pc to same network as mentioned in requirements. 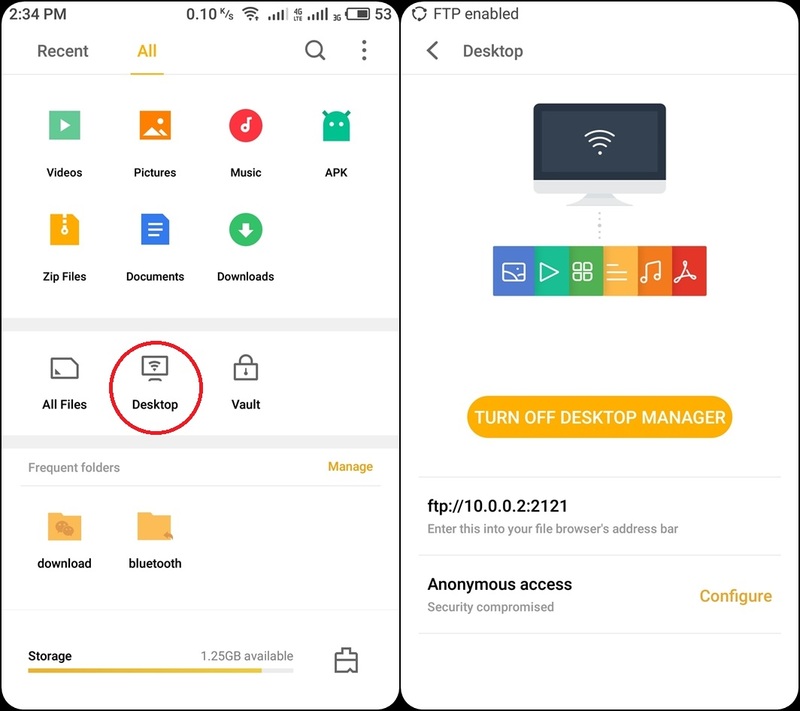 Open “Files” in your MEIZU phone. You will see a FTP link like this – ftp://X.X.X.X:2121. Here X.X.X.X is the IP address of the network and 2121 is port number to transfer data. Below this address, there are some options. Tap on “Configure” to access the options. 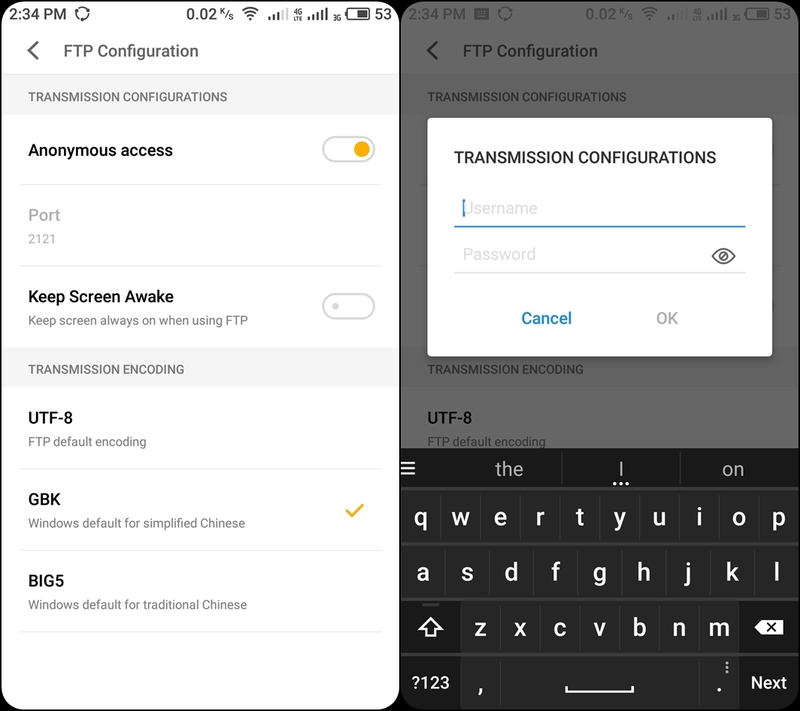 You can enable “Keep Screen Awake” if you don’t want your phone screen to turn off while using FTP. You can also add “Username” & “Password” by disabling Anonymous access. This will protect your data because if someone else know about your FTP link and is connected to same network, her/she can also access your data. Open “This PC” / “My Computer” in your PC/Laptop. Click on Address Bar. Clear all the text with Backspace or Delete button and type the FTP link in the address. Press Enter. Hurray, all your phone’s internal memory data is visible now. 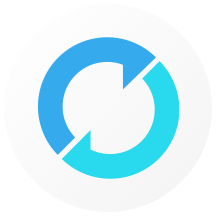 You can now easily transfer data between your PC/Laptop and phone. Use Ctrl + C, Ctrl + X, Ctrl + V etc keyboard shortcuts or Mouse to transfer data. 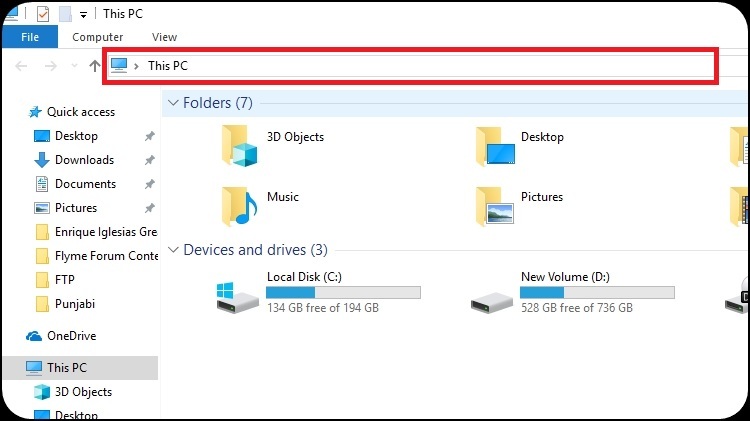 Minimize the Phone Data window in laptop instead of accidently closing it otherwise you have to add ftp link in address bar again. Note: - If you have disable anonymous access, a pop up screen will appear and it will ask you to insert Username & Password. Enter the username & password and click on Log on. You have any suggestions for this tutorial or new topic. No settings required. I entered ftp link directly and it worked. Nobody described these two methods. You asked earlier how to use migration tool and rudra replied you basics. 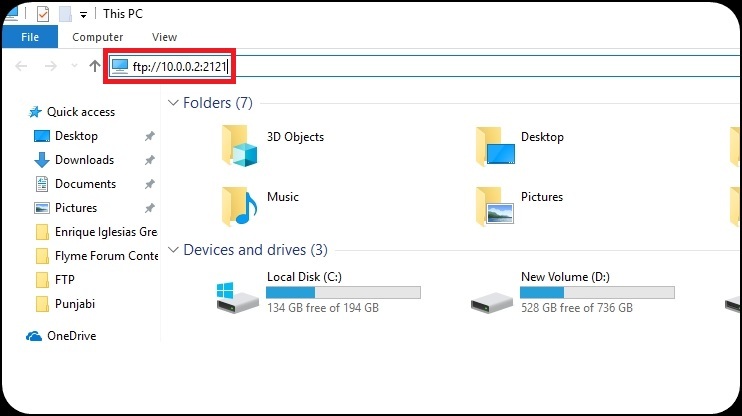 For FTP, there are 2 threads - one by goludr who described how to create Hotspot network in any PC to connect go phone and another tutorial by Fatihaksoy who described the use of FTP using an app called Filezilla. And I have added video tutorials too.